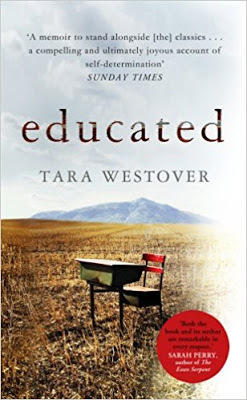 How do I start talking about Educated by Tara Westover? I’ll try with this: I was recommended the book by my boyfriend, who is studying for a Ph.D. in chemistry. He has postgraduate education in common with the author, Tara Westover. But he doesn’t have many other things in common, and especially not a Mormon survivalist upbringing. Tara Westover was brought up in the mountains of Idaho, where her family prepared for the end of the world by stockpiling home-canned peaches, guns, fuel and packing “head-for-the-hills” bags. Instead of school, she helped her mother, a midwife and healer, to brew and sell herbal remedies. She also salvaged metal in her father’s junkyard with her brothers, which led to burns, breaks, gashes, and concussions and were treated herbally at home, with few exceptions. The story of how Tyler decided to leave the mountain is a strange one, full of gaps and twists. It begins with Tyler himself, with the bizarre fact of him. It happens sometimes in families: one child who doesn’t fit, whose rhythm is off, whose meter is set to the wrong tune. In our family, that was Tyler. He was waltzing while the rest of us hopped a jig; he was deaf to the raucous music of our lives, and we were deaf to the serene polyphony of his. Tyler liked books, he liked quiet. He liked organizing and arranging and labeling. Tara followed in his footsteps: she self-taught enough mathematics, grammar, and science to take the ACT, retake it, and then be admitted to Brigham Young University. There, she studied psychology, politics, philosophy, and history, and came to terms with how she had had never learned about pivotal world events like the Holocaust and the Civil Rights Movement. I learned about Margaret Thatcher and the Thirty-Eighth Parallel and the Cultural Revolution; I learned about parliamentary politics and electoral systems around the world. I learned about the Jewish diaspora and the strange history of The Protocols of the Elders of Zion. By the end of the semester the world felt big, and it was hard to imagine returning to the mountain, to a kitchen, or even to a piano in the room next to the kitchen. She needed a near-perfect GPA to qualify for scholarships and be able to continue studying, and she succeeded. What started off as financial help turned into further academic opportunity, and she was accepted for a programme at Cambridge University. This was followed by a Ph.D. at Cambridge, with a brief stint at Harvard. Educated is a book about learning against the odds. It reminded me of the joy of learning, but learning doesn’t exactly come across as a joy in the book. It is more of a compulsion; a literal path to escape that’s about the destination, not the journey. This isn’t a surprise, really, considering what the Westover siblings had to escape from. Tara’s upbringing featured countless instances of emotional and physical abuse, and it seemed to be a similar story for her siblings. If I couldn’t get back down to turn on the light, Richard would pull the book to his nose and read in the dark; he wanted to read that badly. He wanted to read the encyclopedia that badly. To create a new life, you have to say goodbye to your younger self. I thought of my own younger self as I read Educated. About five years ago, I had EMDR therapy to deal with some experiences in my childhood. A key part of it was imagining my younger me and realising that I wasn’t that girl anymore. I learned to send warmth and love to her; to provide support that maybe she wasn’t getting back then. And I also learned to then walk back into my own life as a confident, capable adult. It was tough to get away from my past, and my childhood was incredibly cushty compared to Tara Westover’s. How could I imagine the fortitude she needed to craft her own life and step away from the past (and with it, her family)? Even without imagining her strength, I could admire it though. When I finished the book, I called my boyfriend. “How is it possible that in one family you get such different people?”, I asked him. “Three siblings without a high school diploma, and three with postgraduate education?” He replied that it wasn’t that impossible; just look at my own family. That’s on a much milder level, but touché. Perhaps it’s about different personalities, or that we all respond differently to external stimuli. A tough childhood can build grit in you, but anxiety and depression in your brother. Your sister could experience mental illness but then come out stronger than before. Some of the most inspiring people have had the toughest paths – but they also tend to have spectacular drive and, eventually, support. To build our own impressive path, we have much to gain by exposing ourselves to stories that show us trials, tribulations, and strength in the face of hardship. We may find this in fiction, or it may be in an autobiography such as Educated .